The Fitbit product line is looking a little stale especially after the recall of the Fitbit Force. But that’s seemingly about to change with the addition of several upcoming, and upgraded, models including a fitness tracker with a heart rate sensor. Meet the Fitbit Surge, Fitbit Charge and the PurePulse. 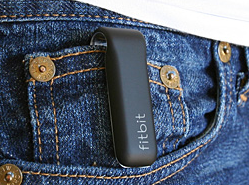 I had a lengthy discussion with Fitbit CEO James Park in January, and he told me Fitbit envisions users having multiple fitness trackers — one for exercise and one for casual use. It seems Fitbit is charging towards that goal with the next generation of devices instead of simply rereleasing the recalled Fitbit Force. The information comes by way Dave Zatz who found US Trademark listings of recent applications from Fitbit for the Fitbit Surge, Fitbit Charge, and PurePulse. The latter is missing the Fitbit branding in the trademark application, seemingly indicating that it could be a separate brand apart from Fitbit itself. Of course, since this information is from a trademark filing, the descriptions and product features might not properly reflect the devices when they launch. Companies tend to load up trademark applications with all the possible functions. According to the application, the PurePulse is a wrist-based sensor with an optical heart rate monitor that displays “time, date, heart rate, calories burned, activity, intensity, and exertion”. The trademark listing notes a “multifunctional electronic devices”, which means this tracker is going to have a screen and from the description, seems to be a fitness-focused tracker. The Fitbit Surge is seemingly geared towards runners, with the inclusion of atmospheric conditions such as wind speed and weather information. The device also has a pedometer, altimeter and a screen to display, among other things, heart rate, global positioning, direction, distance, speed, pace and routes. The listing also notes that the tracker will be able to track sleep and display incoming calls and messages. Lastly, the Fitbit Charge appears to be the lower-end option with many of the same fitness-tracking abilities of the Surge minus the atmospheric and global positioning functions. This model also tracks sleep and will notify the wearer of calls and messages. Fitbit did not respond to a request for comment.